A - The Fall is a story about stories, an enchanting visual poem that honors the curious power that fiction can exert over our lives. It is a film where unexpected delights and terrors appear at every turn. Perhaps for these reasons, it is also a baffling and demented work. It is not, in any sense, an easy film. It utilizes a familiar story-within-a-story conceit, but this nested structure is not, in itself, what makes it a challenging work. Rather, The Fall asks that the viewer accept a secondary story that is surreal, volatile, and frequently campy. Meanwhile, it offers a primary story that is unrepentantly sentimental and examines themes that are stunning in their intricacy. The Fall is nothing if not ambitious, perhaps even foolhardy. It waltzes with catastrophe. It snatches dazzling success from fiasco, I think, because the filmmakers trust the viewer implicitly, never stooping to coddle or condescend. This is an unrelentingly sincere film, and unquestionably the most invigorating work of cinema I have seen this year. The Fall opens in early twentieth century Los Angeles, although the exact year is never specified. (A title indicates that it is "Once Upon a Time," and that right there tells you everything you need to know about the film's sensibility.) A moon-faced Romanian girl named Alexandria (Catinca Untaru) is recuperating from a broken arm in a charity hospital. Alexandria is a curious and unruly child, the sort who never plays with other children and seeks out her own amusements. She always carries a wooden box full of mementos and cast-offs—the treasures of a little girl. Wandering the grounds, she encounters a heartsick silent film stuntman, Roy (Lee Pace), who is laid up with a broken leg. Alexandria and Roy strike up a friendship of sorts. The stuntman tells the girl a short story about her namesake, Alexander the Great, and then persuades her to come back the following day for a true â€œepicâ€. The Fall intertwines the story of Alexandria and Roy in the hospital with the outlandish fantasy that Roy spins for his young listener. This tale concerns the Masked Bandit's quest for vengeance against the vile Governor Odious (Daniel Caltagirone). In the tradition of all great fantasy stories, the Bandit has a circle of colorful allies: an Indian warrior (Jeetu Verma), a former slave (Marcus Wesley), an Italian explosives expert (Robin Smith), a dreadlocked mystic (Julian Bleach), and, er... Charles Darwin (Leo Bill). Each has been wronged by Odious in some way; each craves revenge. Over the course of their mission, the allies escape from a desert island, liberate a slave caravan, and assault a palace, among other feats of daring. There's magic, romance, and lots of faceless Bad Guys. It's a classic fantasy yarn, in other words. Sort of. Roy assembles the plot, such as it is, with a hallucinatory logic that has to be witnessed to be believed. The film's fantasy sequences unfold like a whirlwind dream, without much care for whether the viewer keeps up or finds any of it preposterous. Alexandria doesn't seem to mind, of course, and she keeps returning to Roy's bedside to find out what happens next. Roy takes a shine to her spirited nature, but he may also have other motives for weaving his tale. He needs pills to help him sleep, he explains, so that he can be rested enough to finish the story. Specifically, he needs the bottle in the dispensary labeled "Morphine." Director Tarsem Singh (just "Tarsem" now, apparently) cut his teeth creating visually inventive music videos. However, it would be shamefully dismissive to simply wave away The Fall as a feature length indulgence of the director's MTV pedigree. Tarsem works within a distinctive aesthetic—neither a "video thing" nor a "cinema thing". It is an approach that treats every image like a tableau to be lovingly fussed over. "Phantasmagorical" seems a reasonable adjective to describe his style, but this might overstate the case. In both his first feature, The Cell, and now in The Fall, Tarsem discovered ways to circumscribe his surrealism. In The Cell, the baroque production design was limited to computer-enhanced mindscapes. Here, Tarsem indulges his taste for bizarre spectacle sans sci fi justification, but he still bounds it. The fantasy sequences in The Fall are a peek into Alexandria's mind's eye, her own moving illustrations for Roy's fairy tale. And what illustrations they are! The story of the Masked Bandit takes place in a Near Earth, where the Stone Age abuts the Renaissance next to the Roaring Twenties. Eras and locales ooze and bubble through the film, always gorgeously realized. Tarsem has obsessed over the details of this world so that, frankly, we don't have to. He asks us to refrain from stumbling over the story's unrealities—Charles Darwin?—but to instead submit to the wonder and drama of it all, just as Alexandria does. Borrowing a page from The Wizard of Oz, Alexandria's fantasies incorporate the people and things around her. The hospital's ice deliveryman is the slave, an orderly is Darwin, a beautiful nurse (Justine Waddell) is a damsel in distress, and the menacing X-ray technicians are Odious' legions, who yip like hyenas. For his part, Roy revises the story at whim. It morphs repeatedly as his objectives in the telling and Alexandria's wishes shift. The Masked Bandit is initially Alexandria's father (Emil Hostina), a gap-toothed farmer, but he later becomes Roy himself. Even misunderstandings are woven into the fantasy. For Roy, who makes silent Westerns for a living, the "Indian" is a Native American. But Alexandria, who has grown up among South Asian laborers in the California fruit groves and has never seen a movie, envisions that the Indian is, of course, from India. The acting in The Fall's fantasy sequences is lusciously camp, even histrionic at times. Standing alone, the fantasy doesn't add up to much other than an hour or so of stylized excitement. Of course, these sequences don't stand alone—the story is under the control of another story. Tarsem sprinkles the tale of Alexandria and Roy with a flurry of themes. The result is a framing story as thematically rich as the fantasy tale is visually opulent. The director is manifestly fascinated with the phenomenon of storytelling. How much does authorial intent matter? Is it more important that stories fulfill or disrupt our expectations? How does a mere tall tale blossom into superstition, mythology, or even legend? Most movingly, The Fall posits that stories can facilitate connections between strangers, opening us to self-awareness and laying a foundation for love. Untaru and Pace are the heart of this film, and they both discover portrayals that are curiously magnetic. While the dialogue in the fantasy sequences can be gleefully ludicrous at times, the scenes between Alexandria and Roy boast an unparalleled realism. It's not that they are naturalistic, precisely, but they do perfectly capture a rare thing: a completely convincing interaction between an adult and child who are not related. I cannot do these scenes justice simply by describing them. You have to see them and listen to them: the way that Roy asks Alexandria to repeat her thickly accented mumblings; the way that Alexandria's words reveal the workings of her fidgety, flitting mind; the way that their stance toward each other warms, cools, and bursts with affection from scene to scene. Having just marveled at Simon Iteanu's realistic performance in Flight of the Balloon, it's all the more delightful to witness Untaru one-up him with an even more compelling portrayal of a child. Iteanu's is probably more authentic, but Untaru conveys a searing charm that has no equal in recent films. 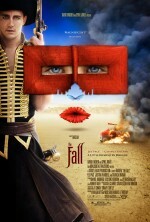 The Fall is a curious wonder of a film. It is melodrama, to be sure, but melodrama done artfully and earnestly. The filmmakers have given us a thing that is beautifully crafted, filled with strange sights, and obsessed with the alchemy that fiction can work on our lives. I can guarantee that some viewers will walk away from it bewildered or even embarrassed. The Fall asks that we, like Alexandria, give ourselves to a story without looking back.